In Searching for God Knows What, Donald Miller's provocative and funny new book, he shows readers that the greatest desire of every person is the desire for redemption. Every person is constantly seeking redemption (or at least the feeling of it) in his or her life, believing countless gospels that promise to fix the brokenness. Typically their pursuits include the desire for fulfilling relationships, successful careers, satisfying religious systems, status, and escape. Miller reveals how the inability to find redemption leads to chaotic relationships, self-hatred, the accumulation of meaningless material possessions, and a lack of inner peace. Readers will learn to identify in themselves and within others the universal desire for redemption. They will discover that the gospel of Jesus is the only way to find meaning in life and true redemption. Mature believers as well as seekers and new Christians will find themselves identifying with the narrative journey unfolded in the book, which is simply the pursuit of redemption. I found that this book was not as fun or light hearted as Miller's earlier work: Blue Like Jazz. However I believe this book had more meat and substance to it. The life boat analogy is very insightful. The way we too often turn spirituality into a formula is also true. Miller writes in a very engaging and challenging style. He asks very important questions and leads you through the process of resolving them - or at least thinking through them honestly and carefully. Not as good as "Blue Like Jazz"
I purchased this book because I was impressed with "Blue Like Jazz," Miller's preceding work. BLJ is meandering and not especially well organized, but as I read it, every 5 - 10 pages some incredible bit of wisdom and/or experience would explode off the page at me. (It's unusual for a young writer of contemporary Christian literature to "register" with a sixty-something person still trying to get a handle on God and spirituality.) Consequently, my copy of BLJ has MANY pages that have been dog-eared for future reference. Like Dude Man, It's Like A Relationship, Not a formula, Dude! See Also: "Blue Like Jazz"
This is a good book. Maybe even a great book. It's hard to tell because Donald's earlier work "Blue Like Jazz" set such a high standard for himself and his writing that I doubt anything could have lived up to my expectations. For that reason if you have not read anything by Miller I would actually steer you toward "Blue Like Jazz" first. It is definately his best book, to date. However, if you have already read "Blue Like Jazz" and - like I did - am now searching for more Miller to read, then I would recommend this title to you as well. It may not be quite as good as "Blue", but to criticize it for that reason would like criticizing Da Vinci because "The Last Supper" doesn't quite measure up to the "Mona Lisa". It took me a while to get used to the author's cozy stye of writing, but eventually I grew to enjoy it. It's messy and all over the place - just like life and very conversational. I've been reading some heavy theological stuff lately and this was refreshing. I loved the 'lifeboat theory'. His explaination of how the 'lifeboat' relates to the fall of man was probobly one of the greatest things that I've ever read. It really makes a lot of sense. I think everyone should read that chapter. I was able to read the Bible like I used to after reading this book. And it's been months, maybe closer to a year since I was able to do that. The text was fresh to me. I saw a few things I hadn't noticed before. Since he eluded to the fall in the book, I thought I would go back to the beginning and read those chapters for the billionth time. I wasn't really expecting to see anything new. But I did. And it was real again. I have to say I was cringing through a good part of the book. I know Donald Miller has had bad experiences with religion or the church in general, and with conservatives and republicans. I can certainly see why he holds those views. There are enough people in all of those camps whose examples could drive him away. I get the sense that the author feels that most Christians who are conservative republicans are less than intelligent and have been brain washed. That makes me sad. I can speak personally and say that I care about people living in poverty and under oppression. I care about the environment and about peace and about healthcare. These are important issues to me. And I *still* have to go with conservative views on just about everything. To me, conservative views and economic policy just make the most sense and it's not because I care less than liberals do. I can see how people who also care about these things hold to a liberal world-view. I don't think they are crazy or demented. Okay, enough of my rant....back to the book...(my previous thoughts actually do tie in to what I am going to say next - I just don't have a clear segue). It seems to me that the problem is not with religion or today's church or conservatives or republicans or liberals or democrats, but it is with the need to understand the scriptures BOTH from a theological point of view AND from experience. Without theology, the experience or relational aspect of Christianity is not grounded and is even dangerous. There is no expectation of an absolute truth and so all of faith is relative. Thus God becomes not who scriptures say he is but who I want him to be. It is particularly difficult to study the scriptures this way. Theology in the form of bullet points and fomulas (i.e. creeds, the articles of religion, the catechisms and things like the five points of Calvinism) is good and necessary. These things exist to give focus and steadfast understanding to our fickle feelings and experiences. In studying these things, the worshipper can stand on the shoulders of giants instead of presuming that he alone is a giant who can figure everything out himself. Conversly, I would say that religion without relationship is dangerous in that it misses the point. Certainly God does not desire this. Scripture makes so many references to the act of offering sacrifices versus the offering of the heart. And yet He did not do away with sacrifices in the Old Testament - He required that his people sacrifice as well as call upon Him. In the new testament when Christ came to be the final propitiation for sin, He said that He did not come to abolish the law but to fulfill it. Clearly the law (or religion) is important but it is not fulfilled nor has meaning without Christ. Christianity does not work in an 'either-or' mentality -either religion or relationship. It is 'BOTH-AND'. Why is it that it is so hard to find a church that embodies this 'both-and' principle? It seems that they love to throw the baby out with the bathwater. The formulas, church history, tradition, creeds, systematic theology are all important. Much more important, in fact, than Donald Miller acknowledges. But without a true, ongoing, growing relationship with Christ, theology just doesn't make a whole lot of sense. I think this was one of the author's main points and it is definately one I needed to hear. It is the responsibility of the worshipper to maintain an understanding of both at all times. This is such a difficult task. It seems to me that our finite minds just were not created to focus on all of that at once, but fortunately, God makes these things possible. I am constantly in this desperate struggle to remain focused on both. I have been concentrating almost exclusively on only one aspect of my faith. I needed to be reminded of the 'both-and' argument. That is why I loved reading this book. What Miller's musing about in this book is how we have a tendency as Christians to look for formulas and checklists in scripture and completely miss the point of it all which is the ideal of relationship. He suggests that we tend to look to scripture as a self-help book that gives us the steps to a better life or the steps to God and when we do that we are disappointed because the bible is void of formulas and instead talks mostly in terms of relationships (between us and God and us as humans). Bringing out this point, he mentions how we can tend to look to doctrinal statements and gospel tracts to give us the steps or bullet-points on how to know God when Christ was always talking about how to know God in metaphors of relationship like sheep to Shepherd or child to Father. The book is not written to be a conclusive biblical study or position statement, he even states at the end in an appendix that he while he believes whole-heartedly in the value of doctrine and theological study, he intentionally deemphasized those things in the book to focus on his point regarding the need to understand the relational aspect. So there were times I thought he took things a bit far and certainly did not agree with all he said. However, there were many times when I just stopped and said "man I have never thought about _____ like that." Miller has a way of simply and casually being quite enlightening. I saw this book on the shelf and grabbed it based on the title alone. The cover was pretty cool, though you know what they say about judging books that way. Anyway, the title was something I could relate to, so the book got my attention. Miller takes the scenic route through some of the concerns of life and how that all relates to God. He particularly focuses on what humanity lost in the Fall through Adam and Eve and the importance of gaining our sense of worth and value from God. If not, we end up with the "lifeboat mentality", as he refers to it. It is the implications of this that he deals a lot with, and how Jesus responded to the same thing. Unlike some reviewers, I found the book a ceaseless pleasure to read, and one that had a remarkable level of honesty about things. It was this candid look at life and Miller's own personality that really appealed to me. It also made the book that much easier to relate to, in the sense that it was clearly written by someone who is as messed up as I am, (or was). Perhaps, for me personally, was Miller's "life is a fine wine" comment quoted from one of his friends. I really appreciated the insights into accepting reality as it is, and not having unrealistic expectations, (something I am prone to). While not everything is deep and profound in the book, much of it surely is. This is the second book I've read by Donald Miller, and I can't really put my finger on what I like about his books. Something keeps me coming back to his work (maybe it's the deficiency in Christian authors - just kidding). It might be the way he explains things in modern day language, or the way he makes analogies to help clarify complicated points. When Miller tries to explain the way current day evangelicals have alienated the masses, for example, he summarizes his point by stating, "In war you shoot the enemy, not the hostage." But sometimes his books are somewhat unstructured, and I find that very frustrating. I'll read a chapter, for instance, and then pause to reflect on the point (his message), and the message seems too elusive to grasp or too unstructured to understand. Not all his chapters, just some of them seem like this. His conversational tone and his sentimentality can add and also detract from his books. Sometimes it works; other times it is overdone. Having said all this, would I recommend the book? Absolutely. Enlightenment for the Religious Right. I have come from a Conservative Christian background. Miller's readings are spirit filled and humbling to the right sometimes "elitist" point of view. Mind you, Miller is not against fundamentalism in the slightest, he is rather, against our current mentality used in approaching such topic. I credit Miller's books for my recent conviction to remove myself from a political way of thinking which had engulfed my entire being during years past. 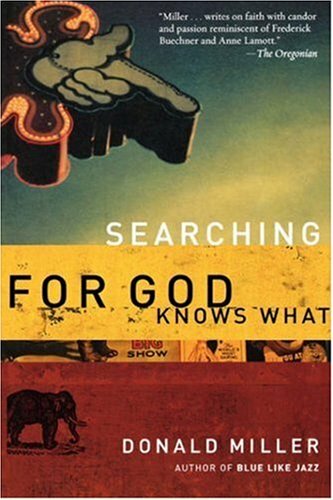 "Searching for God knows what" was sincerely the best book I have ever read (in terms of its life changing value). Not only does Miller make a compassionate case for a relational God, but he condemns many actions (i.e. political rifts) as being mere replacements for God's love which deplited after the fall of man. Once man sought God's approval, know he seeks the approval of his fellow humans, essentially, winning a popular position in the "lifeboat). This was one of the best books I have read. This was a well written book by Donald Miller, whose writing in this book provoked thought about reading the bible, God and our relationship with him. His views on the bible and God are more unconventional, but very refreshing and in the back of the book he has an endnote about his beliefs the bible, as a kind of note to critics who may think his ideas about the bible and God are way out there. This was a brilliant read and he was often humorous at times, his writing reminded me of how Garrison Keillor writes, I think he even mentions in a footnote in teh back, that he read Garrison Keillor before writing the first chapter. While Searching for God Knows What lacks the angst of Blue Like Jazz, the first half of the book has close to the same feel, other than the angst I mean. My favorite chapter is titled "Imposters: Santa Takes a Leak." If anything, this title should give you an idea of what Miller is about. He opens the book by sharing a personal story of a Christian writer's conference he once attended where most of the ladies at his table were preparing to writing formula books. One, a daily devotional while drinking coffee, another a daily devotional book to read while enjoying tea. Miller dropped his diplomatic covert nun that saves the world idea and set out to write his devotional book to read while eating ice cream, but he just couldn't cram the complexity of the Biblical narrative into three or five or ten simple bullet points. Miller also presents a reality-show type model of existence in a lifeboat where one person must be tossed overboard. To avoid that terrible fate, he says we all argue our worth and form alliances. It's a great model and explains society well. The author even goes so far as to argue against placing morality above Jesus and His message. And he does a sound job making this point. The second half of the book seems to slow down. It's a little more preachy than the first half. It's not bad; it's just not as consistent, not as raw, and not as funny. Searching for God - in the church! Such a neat perspective . . . I borrowed this book from a friend. I think it has a great perspective on living a christian life. I took many ideas from this book. The biggest one is that we don't need to worry about what anybody thinks of us, because God is the only one who matters in the end. I think it would be a great book for a teen to read that may be struggling with peer pressure. He is a good author. A phenomenal book. Reading Donald Miller is like eating a piece of gourmet chocolate cake - you try to eat it slowly because you think you should, to savour all it's richness, but you end up scarfing it down quickly because - you just couldn't help it! I stayed home for 3 nights in a row just to "cozy up with Don" and read this book. I seriously felt like I was hanging out with an old, funny, deeply insightful friend. That's why we read, isn't it? To feel like we're not alone? Don put into words things that have been knawing at me for the last few years but i didn't quite know it. And he did so beautifully. The overall point of the book is that Christianity is not a formula, or a list of facts and ideas that you intellectually agree with. Instead, at its core, it is a complex group of narratives (written about in the Storybook called the Bible) that illustrate the basic idea that God is a person with whom we were created to have an intimate, personal, mysterious relationship with. It is this relationship alone that gives one true, lasting security and validation as a beautiful and lovable person. This relationship was broken a long time ago in a garden far far away, and as a result we are all messed up and have been trying for the last few thousand years to get people to love us so that we will feel less insecure and more lovable. Only a Reunion to beat all reunions, a heart-felt reconnection with our Maker can give us the security, love, and ultimate freedom to really love others without expecting any sort of "redemptive love" from them in return. We can be loved like we were meant to be loved, and thus we can love like we were meant to love. This is a powerful paperback book that many churches are finding refreshing and insightful to provide a new look at the community that has developed around them while they were sleeping in their comfortable Modern Rationalist religious homesteads. They find themselves unable to talk to their non-Christian neighbors about anything meaningful. Miller writes out of his own experience of discovery in his own spiritual pilgrimage. This is a hilarious book, that often had me bursting out unexpectedly because of his splashes of off-hand delights as he expressed an experience or described a situation. He also has a healthy ability to laugh at himself and in this way puts his own limitations in perspective! This helps the reader approach deep challenges requiring change in our attitudes as we discover that there are whole areas of reality out there that we did not yet know about! Millions have read his delightful book Blue Like Jazz and other books about his trek through through life. Here he is more reflective and presents a more analytical survey of what he sees in current society and how the message of Jesus might address it. This is one of the volumes in which Miller has addressed the changing and changed culture many churches are puzzled to see around them. The current western American culture is not based in Christian religious traditions, has no knowledge of Christian or biblical stories or basic concepts and is oriented to a world very different from that of the traditional educated rationalist culture of abstract established doctrine. They find the current generation asking questions about life and reality and truth that many churches find themselves unequipped to answer, largely because they have accepted a pre-packaged faith that was handed down in the cultural forms and language of the past. The church speaks a language no one else still speaks. Often they cannot express their faith themselves, other than in religious cliches and traditional terms. Many Modern Christians (also called Modernist, including liberal and fundamentalist ways of thinking) are unable to express their faith in common terms of speech used outside the church. This increases the sense among the society at large that "Christianity" is irrelevant and outdated and "Christians" as uneducated and unaware. This further blurs the distinction between Christianity as a religion or religious institution and real faith found in the the teachings and life of Jesus and the New Testament writings. Non-Christian society usually does not even know what "Christians" believe. There is little communication going on. Miller addresses this situation. The current generation is now usually referred as Post-modern, indicating they have moved past the rationalist and naturalistic assumptions of the Enlightenment foundations of the Modern worldview. They are seeking spiritual values beyond the empirical, scientific categories that are established only through the human senses and their technological enhancements. One thing I liked about this book by Donald Miller was that he was so intent on referring everything back to the Bible, bypassing the inherited cultural traditions that are the real basis of much of what we see in Modern Christianity. He wants to focus on the faith of Jesus and the concepts of the New Testaments more than the developed western cultural traditions. I got this book at a small rural Methodist Church in Pennsylvania, where the church was providing these free to members and visitors. It was good to see a rather traditional church in a very traditional Allegheny village providing this resource. This would be a way to learn more about the larger swift-flowing American secular culture, and perhaps help these folks of faith understand differences they were observing in their work in larger urban areas and in their TV news. I recommend this and other books by Miller. This is one author who is wrestling to understand his society with its exciting multi-cultural challenges and opportunities, and discover how God is working in today's world just as others historically discovered God working in their life and times. I loved the way Donald Miller thinks. He is good at laughing at himself and us in our ways of seaching for the divine. Donald Miller's term, "searching" is a good word for this book. My generation resonates with this theme because we all are searching for God in unexpected places. This book paved the way for other books that dive deeply into the things of God. I wish Donald had engaged the Bible a little more in this book. He meanders from topic to topic without offering much hope for the reader. A good read, though. The first chapter in this book reflects the witty writing and good narrative that Blue Like Jazz (Miller's Bestseller) has from cover to cover. However, as a whole this book is not nearly as good. I think the major change that lowered the books appeal for me was that in Blue Like Jazz, Miller consistently used his 20-something experience as the running story. His relationships with roommates, his trying to make it as a writer, his involvement and struggles with the Church, etc. With this book, Miller reflects on theological and philosophical concepts--and while that's all well and good (I have a Doctorate of Philosophy, I should be able to deal), it's just not that interesting of a read. I am wading through this book for the second time. I am about twenty pages past where I fell off last time, and things aren't looking good. Don't get me wrong. I like Miller. I thought "Blue Like Jazz" was an inspiring and important book. "Searching for God Knows What," however, is doing just that - searching. And searching. And searching. The writing here is nowhere near as good or engaging as BLJ. Miller seems to harp a lot on certain themes, repeating his theses over and over throughout the pieces rather than letting the pieces support the theses through good writing. And the points that he is making aren't revelatory. When I read BLJ, I would finish a chapter before going to bed, and all day the next day I found myself pondering what I had read over and over. It was the best kind of writing: that kind that takes a while to simmer and sink in. This book, however, only makes broad and shallow points, never daring to go very deep. And sadly, Miller already sounds like he's trying too hard to be himself. I've read pieces from "To Own A Dragon," and found them very entertaining and well-written. In my opinion, Miller is best when he writes little vignettes and more memoirish stuff rather than these essays. SFGKW is too meandering, too unfocused and poorly written. At times it honestly reads like a [...]paper. Here's what happened. I set out on a two-day road trip with Donald Miller and all I did before he started talking was to was ask him, "So how do YOU think a person becomes a Christian?" If that didn't happen, it's the way it seems. He starts by making sure I understand that a person really doesn't "become" a Christian, but that we are always in process of "becoming" followers of Christ. Now he never really says that, in those words, but that's how it seems. By explaining that the Bible is not a how-to manual but a love story, Miller rejects formula salvation in favor of an ever-deepening, personal, and unique relationship with God. Miller describes a relationship not unlike a marriage, one that is to be nurtured and cherished. After several coffee stops and a couple of sandwiches while driving and riding, some pauses to re-direct the conversation toward what Jesus is not, and a few questions as answers to questions, we rest in sleep for a while only to begin the same conversation again at breakfast. Isn't that the way this seems? I don't know if Miller is in love with Jesus - I think he is - but I know he is in love with his relationship with Jesus, and that's almost the same thing. Or, at least it seems that way. If you read my review of Blue Like Jazz: Nonreligious Thoughts on Christian Spirituality you know how much I adore Miller's writing. This book is a continuation on that theme, and suprisingly manages to surpass it. His writing is pure poetry, with hidden depths and insights. It will make you think. It's at the top of my all-time favorites list. The most interesting concept here to me is that (whether literally or figuratively) at the fall of man humankind lost its identity. In Eden we knew our inherent value and place in relation to God. Since the fall we have lost our sense of worth and our relationship with Him. Everything God has done since has been an effort to restore that relationship. Almost everything we do since then is an effort to establish our own worth and status. It is a fascinating concept of human motivation and my summary doesn't do his writing justice. Much religion is ostensibly an effort at a relationship with God but typically denigrates to an ego-based identity. How many true seekers do you know? And how many self-righteous people that claim superiority due to their religion? Ironic, isn't it? That the very people who claim superiority for having higher values than others settle for the value of the identity rather than the actual relationship. After reading Blue Like Jazz, I was looking forward to another fresh look at Christianity from Donald Miller. I can't say I was completely disappointed, but I also wasn't as impressed as I was with his first book. "Searching For God Knows What" is a good book. It's got a lot of wisdom in it, and it's obvious that Miller spent a lot of time writing out his thoughts. Overall though, I thought a lot of it read repetitiously. I think he had a good concept - and really, a good message - but probably could have been done in about half the pages. A lot of this reads as filler. If you're a fan of his other books I think you'll find this an enjoyable read. His writing style is fresh without being condescending and it's chock-full of material to sit and think about. I found his chapter about communion to be the highlight, while the last chapter on Romeo and Juliet left much to be desired. The first three chapters draw the reader in with witty and humerous prose. Many of Miller's ideas are refreshing. Especially the overriding theme that our relationship with God is relational and cannot be "cloaked in formulas." Miller does an excellent job of driving home the point that jumping through hoopes and going through motions is not how a person should "act out their spirituality." After chapter three, however, the book turns into a rambling of Donald Miller's opinions on everything from God to politics. The book turns into Donald's diary of rants against radical televangalists and overzealous Christian ministries. The witty conversation soon turns into pure opinion based only on observations from his personal experiences. Donald's analogies prove to be helpful, although very long-winded in their explanation, and his understanding of Romeo and Juliet in a Christian context is very impressive and insightful.